Going on holiday can be tough for dog owners. You spend the whole trip worrying about your beloved pet whilst it’s stuck in a kennel when you should be having a good time. So why not bring them with you? It’s not as much of a hassle as you might think. Here at Craig Manor we love having dogs to stay, so we thought we would demystify the whole process so that, when you come to stay, we get to enjoy meeting you and your dog. This infographic takes you step by step through the whole process of entering Europe with your dog. We cover things such as what the legal requirements are, booking a flight, choosing an airline, what to check when picking a destination and how to make sure your dog is ready to fly. We hope this will simplify a process that once seemed daunting, into something a lot more straightforward. That way both you and your dog will be able to enjoy a relaxing holiday. <a href=https://www.craigmanor.co.uk/travelling-in-europe-with-your-dog/><img src=https://www.craigmanor.co.uk/wp-content/uploads/2016/05/14.jpg alt=”Travelling in Europe with your dog” width=”450″ /></a><br /><a href=https://www.craigmanor.co.uk/travelling-in-europe-with-your-dog/&gtTravelling in Europe with your dog</a> by <a href=https://www.craigmanor.co.uk/>Craig Manor</a>. 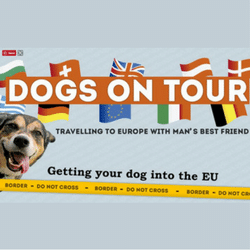 <a href=https://www.craigmanor.co.uk/travelling-in-europe-with-your-dog/><img src=https://www.craigmanor.co.uk/wp-content/uploads/2016/05/14.jpg alt=”Travelling in Europe with your dog” width=”950″ /></a><br /><a href=https://www.craigmanor.co.uk/travelling-in-europe-with-your-dog/&gtTravelling in Europe with your dog</a> by <a href=https://www.craigmanor.co.uk/>Craig Manor</a>.